*And I’ve always been wanting to apologize for the low quality screen caps (I just never got around to it). I get them from different websites that provide the episode with english subs so they might not be in the best quality, but I hope you guys still enjoy my recaps. The episode starts out with Soo Kyung scolding Barassi for chewing her shoes. 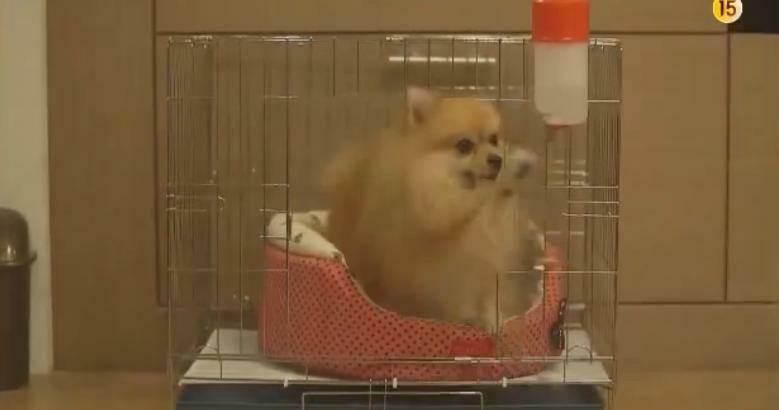 But being the boss that he is, he ignores her and runs into his cage. Hahaha. SOOOO CUTE. That’s when Soo Kyung receives a call from Jin Yi to turn on her T.V. and watch ‘Olive Channel’ a food show. The TV show airing showcases people eating some delicious pizza, which amuses all 3 neighbors who are happening to watch the same TV show at the same time. They all agree to eat some pizza together a few minutes later. 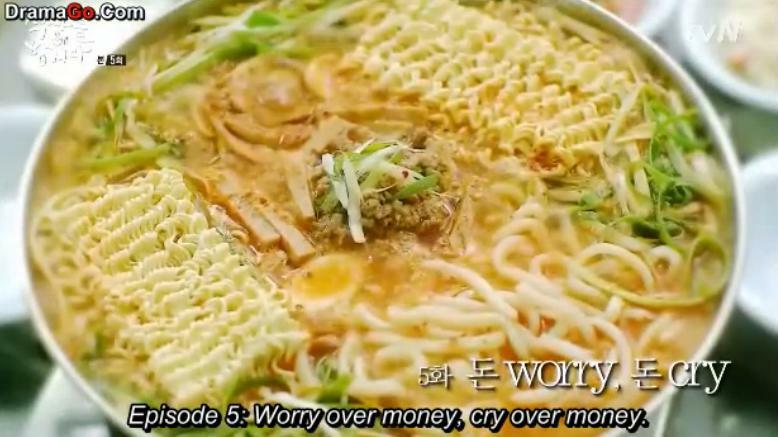 Today’s episode is called ‘Worry Over Money, cry over money.” Money?! Money?! What is this talk about money? Haha. At the pizza restaurant, uri 3 neighbors are conversing a bit but stop when the pizza arrives at their table. 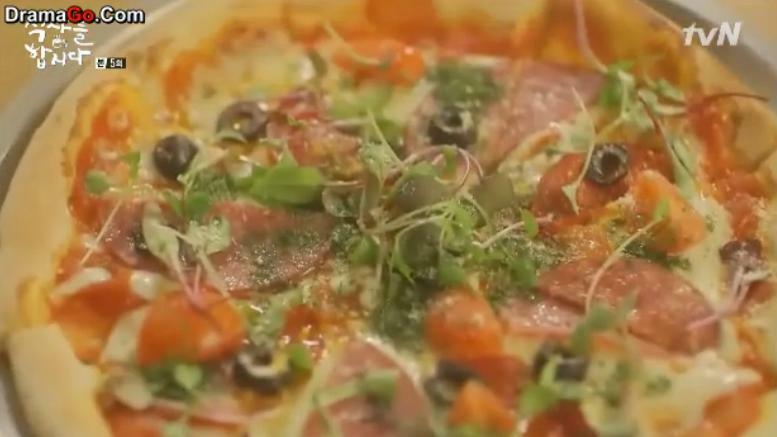 Soo Kyung complains that she can’t eat the pizza without any pickles to which Dae Young interrupts, “Do you know what the forbidden word that you should never utter to Italians are?” Jin Yi and Soo Kyung look at Dae Young with curiosity only to be told that it’s pickle. 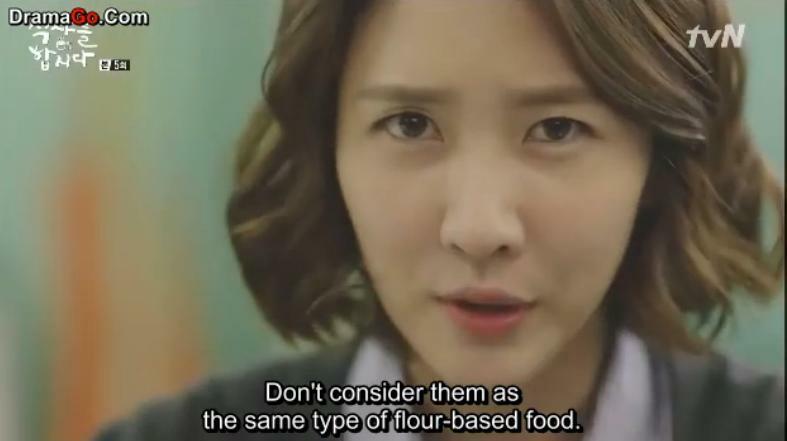 Dae Young explains that the sour taste of the pickle will take away the original taste of the pizza which confuses Jin Yi causing her to question this ‘original taste’ from pizzas because they all taste the same. 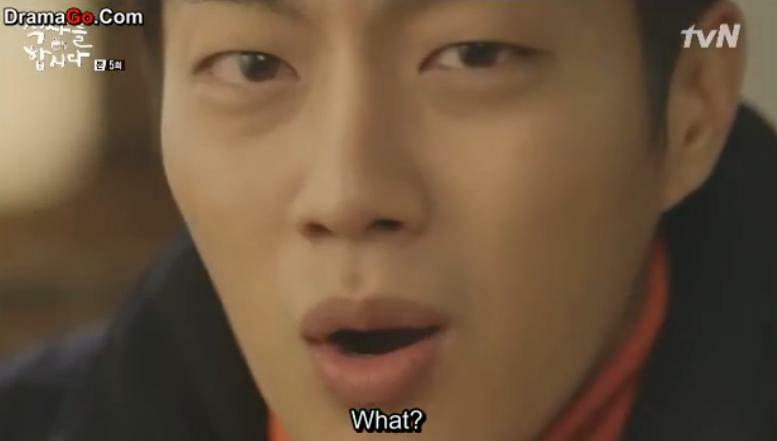 Like how Dae Young has been doing the last five episodes, he gets offended and goes off on a rampage about pizzas. After finishing the pizza, they return to the apartment building and check their mail. All of their maintenance bills have arrived so they all analyze the bill and discuss about it. When Soo Kyung discovers that Jin Yi’s bill is $500, she gives some helpful advices to Jin Yi so that her bill never turns out that high again. Dae Young then asks Soo Kyung how long she’s been living alone to where she confidently answers “3 years” but 3 years isn’t as long as Dae Young who has been living alone for nearly a decade (now let the professional talk here). He says that if they treat him to a cup of tea, he’ll give away his secret to maintaining a low maintenance bill so they head out to a coffee shop. Dae Young reveals that the way to maintain a low maintenance fee is to just simply leave your apartment. There are so many places that are warm and hot you don’t need to stay in your apartment to keep yourself warm. That’s when Jin Yi receives a call from a guy from the parcel service who happened to go to Jin Yi’s old house so she tells him to just leave the item there where she’ll come pick it up. Dae Young volunteers to take her to her previous house while Soo Kyung decides to ride along. 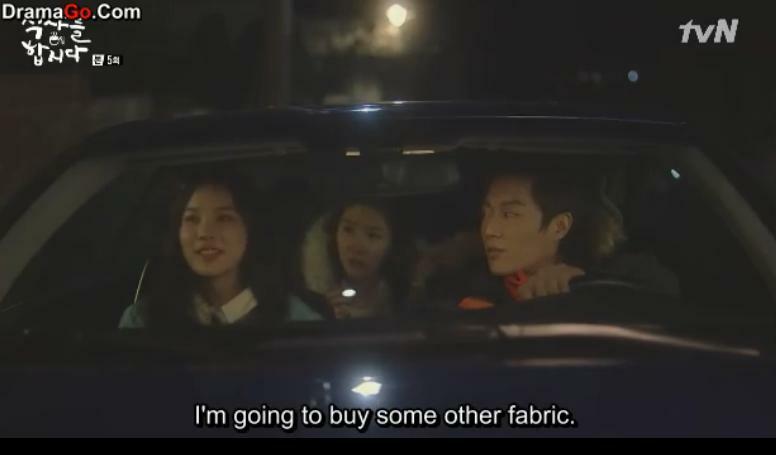 When they arrive outside of Jin Yi’s previous house, she suddenly changes her mind and says that she doesn’t want that fabric that she bought for her apartment anymore and wishes to go back to the apartment. Soo Kyung misunderstands and tells her to just keep the fabric since she bought it but Jin Yi refuses to and plans to buy another one. 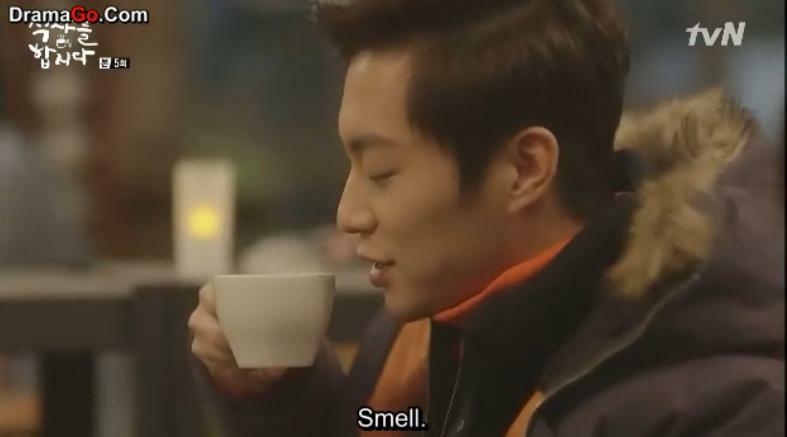 Dae Young, being the awesome and understanding person that he is, takes them back home without any complaining. The next morning, Dae Young is busy sleeping when his doorbell starts ringing endlessly, causing him to have no choice but to wake up and answer the door. When he opens it, he finds this middle-aged man standing there asking him if he’s Goo Dae Young to which Dae Young answers yes. It turns out that the man is the brother of one of Dae Young’s insurance clients and had listed Dae Young as the beneficiary to her insurance before she passed away. While they’re talking, Soo Kyung exits out of her apartment to find both guys outside of Dae Young’s apartment so Dae Young says for them to go inside his apartment to talk instead. Inside, they continue to speak about the insurance in which the brother concludes that Dae Young give up on receiving the insurance or else he will get sued by the brother. At Soo Kyung’s work place, Lawyer Kim checks up on Soo Kyung to see if she’s done her tasks yet in which she replies that she’s done all that Lawyer Kim has asked her to do. Lawyer Kim tries to make the tasks even more difficult for her by increasing his demands, but Soo Kyung just smiles and takes his demands respectfully. 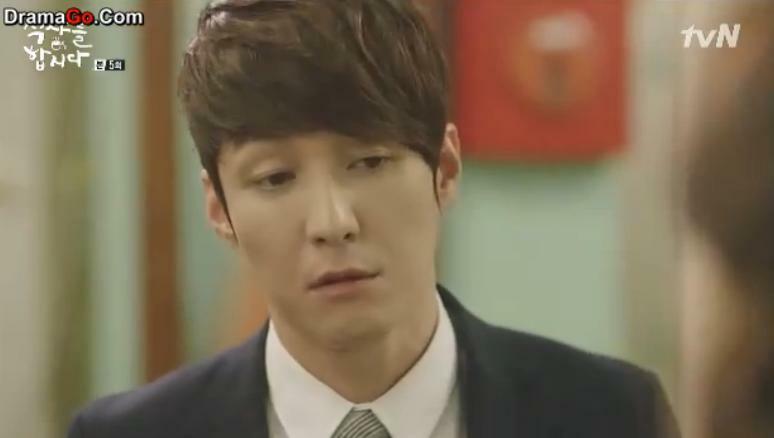 Haha, Lawyer Kim – your revenge scheme isn’t working very well is it? Lol. It seems like Soo Kyung is easily taking in all the scolding from Lawyer Kim because they’ll be getting a year-end bonus so it doesn’t matter to her how much he scolds her. Oh, Soo Kyung. Hehe. 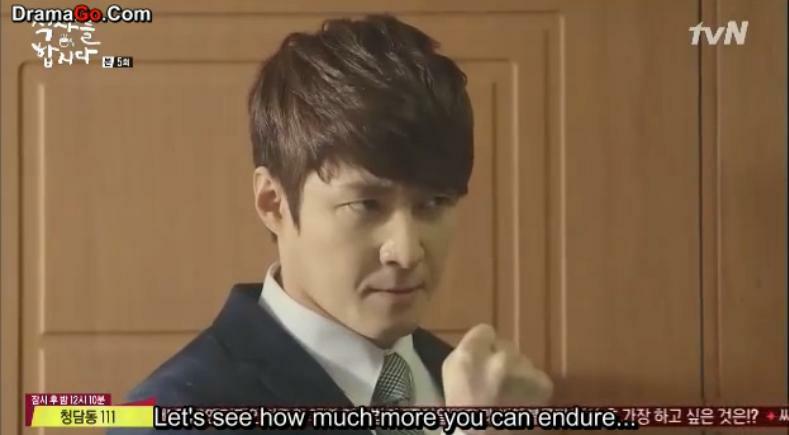 Lawyer Kim overhears Soo Kyung and grows mad. He plans to make things even worse for her than it already is to see how much more she can endure his nagging. Now this is what I’m talking about. Lol. Since Lawyer Oh is new to the attorney office, she asks about the year-end bonuses in which we find out that Lawyer Kim gives his employees year-end bonuses. He’s not all that bad after all eh? On the subject of year-end bonuses, Kyu-sik reflects on the last time he had money for himself (which was apparently a verrryyyy long time ago) and asks that Soo Kyung transfer his bonus to his secret bank account, but Soo Kyung refuses to, reminding him that she’s his wife’s friend. When Lawyer Oh leaves the two alone, Kyu-sik and Soo Kyung start to talk about her behind her back. They disapprove of how she’s so stingy with money and how she wants them to treat her out for food with their year-end bonuses. Back at the apartments, Kyung Mi has secretly come to Soo Kyung’s place to get a break from her family and in-laws. While sneaking in, Jin Yi catches Kyung Mi trying to enter and holds a short conversation with her. After explaining her situation to Jin Yi, Kyung Mi wonders where Jin Yi is going. It turns out that Jin Yi’s going to sell one of her luxury bags in order to get enough money to pay off her maintenance bills, AKA making sacrifices. At the attorney office, Kyu-sik is looking over the blog that Soo Kyung introduced them to to check what they should eat for lunch until he notices Soo Kyung’s comment that she posted on there. But Soo Kyung is clueless and denies commenting on the blog. That’s when Lawyer Kim exits out of his office and asks for Soo Kyung to decide what they’re eating for lunch. 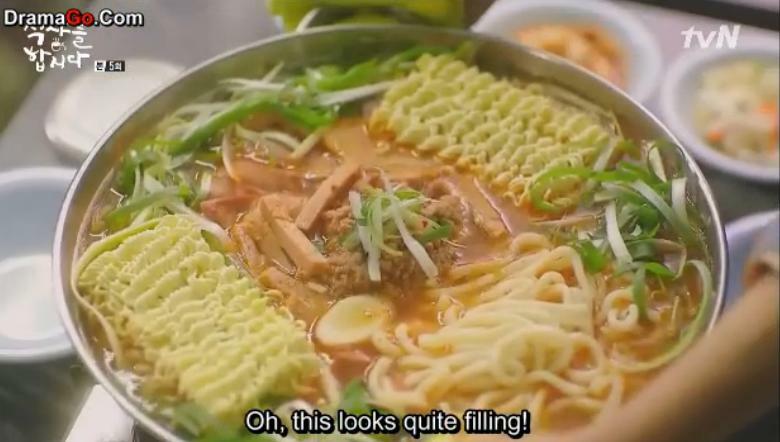 After deciding on some budae jjigae (spicy sausage stew), Lawyer Kim agrees surprisingly and they head out together for lunch. Of course Soo Kyung finds it weird that he’s being so kind towards her, but she just brushes it off as maybe he’s sorry for scolding her earlier so she doesn’t think too much into it. Hehe. At the restaurant, Soo Kyung places the order and includes one bowl of ramen noodles than another bowl of udon noodles. Lawyer Oh warns her to be careful as both are refined foods which causes Soo Kyung to become offended and she goes off on her own rampage about the difference between both noodles (uh-oh, is someone becoming like Dae Young now? Hehe). When Soo Kyung finishes with her rampage, Gyu-sik notices the similarity between her and Dae Young which causes him to assume that she and Dae Young are dating but Lawyer Oh quickly attacks the assumption while Lawyer Kim (who used to have a crush on Soo Kyung) starts coughing. Hahaha. Finally the budae jjigae arrives so they all dive in and start eating the delicious meal. While eating the dish, Soo Kyung starts to get hot and sweaty so while fanning herself unbuttons the first button on her shirt. This is all done in front of Lawyer Kim who cannot stop watching her cool herself down. (I wonder how many takes it took for them to film that scene. Hahah. Too hilarious). It’s Jin Yi’s turn to get some screen time as we focus on her at a store to sell her luxury bag. When the transaction is being made, the sales lady is willing to give Jin Yi $1000 for the bag that Jin Yi paid $7,000 for. When Jin Yi complains that she paid $7,000 for the bag, the sales lady is thisclose to raising the price to $2,000 but Jin Yi interrupts her in excitement because she’s going to get $1,000 for the bag. So they set the price at $1,000. (these are one of those moments where I wished Jin Yi was a bit smarter, haha). But then just when Jin Yi is about to leave, her eyes are attracted to another bag in the store which Jin Yi eventually ends up buying for $400. So Jin Yi sold her old bag, but ended up buying another one. Oh Jin Yi, you have a long way to go. Dae Young comes to visit the attorney office because of the issue over being sued by that brother that visited him earlier this episode. 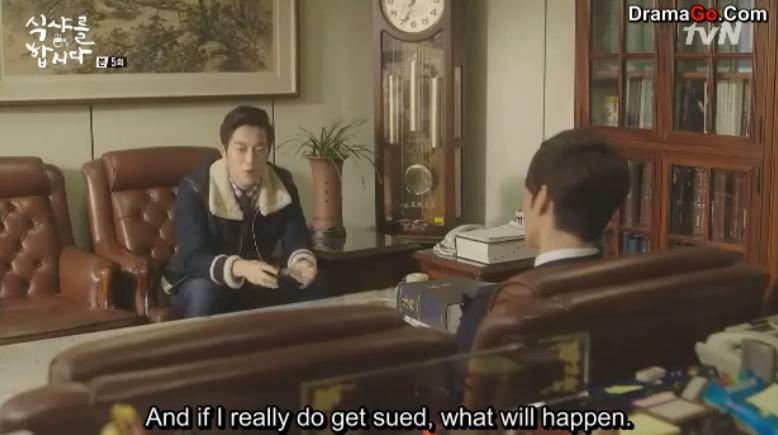 So he talks about it to Lawyer Kim who advises Dae Young on the situation and tells him to not worry about it. Lawyer Kim receives a call and steps out of the office for a bit, leaving Dae Young alone with Lawyer Oh who came to give them some coffee. When Lawyer Kim’s gone, Lawyer Oh immediately sits in the empty seat next to Dae Young and worries about him but once Lawyer Kim comes back inside the office, she stands up as if nothing’s happened and exits out of the office poised. Hahaha. Too funny. At the apartment, Jin Yi sees Kyung Mi again so she shows Kyung Mi her new purse that she bought. Afterwards, Kyung Mi has to go to the grocery store so along with Jin Yi, they head over to the store to buy whatever they need. Soo Kyung barges into the attorney firm, yelling that she has finished with transferring Kyu-sik’s year-end bonus into his account. Her co-workers assume she ate many chocolate candy bars (since that’s what Soo Kyung does when she gets stressed out) to which Soo Kyung admits that she did because she’s stressed – something Kyu-sik wouldn’t understand because he got his year-end bonus. But Kyu-sik doesn’t think the bonus is enough; he believes that they should receive a $100,000 bonus like Dae Young. This is Soo Kyung’s first time hearing about this $100,000 bonus so she asks for more information. Lawyer Oh reveals that a policyholder had listed Dae Young to receive her insurance of $100,000. Soo Kyung thinks that Dae Young might have written his name down when the contract was getting signed, but Kyu-sik refutes that theory and says that the woman changed the beneficiary when Dae Young changed insurance companies. Kyu-sik switches the subject to tell Soo Kyung to get married, but she says that she might meet an untrustworthy man like Kyu-sik who wants his year-end bonus in his secret account, so she’ll stay single for now. After getting the fabric from Jin Yi’s old house, Soo Kyung brings up the $100,000 that Dae Young will be receiving and what he plans to do with the money. After revealing his plans, he tries to get Soo Kyung to become an insurance sales person, but it turns out that he was only persuading her because if he’s able to get someone to sell insurance, he’ll get one ton of gold. AHHH, SO CLOSE. Hahaha. Freaking Goo Dae Young. The things he does man. Speaking about getting insurance wasn’t enough; he wants Soo Kyung to sell insurance. At Kyung Mi’s place, she asks her husband Kyu-sik about the year-end bonus that he got but he tries to avoid her question by saying that he never received one. That’s when she tricks him into thinking that she’s calling Soo Kyung which causes Kyu-sik to panic and admit that he did get one in the end. (she ended up using the pepper shaker as her phone to make her husband think she was calling. Hahaha. Smart smart). 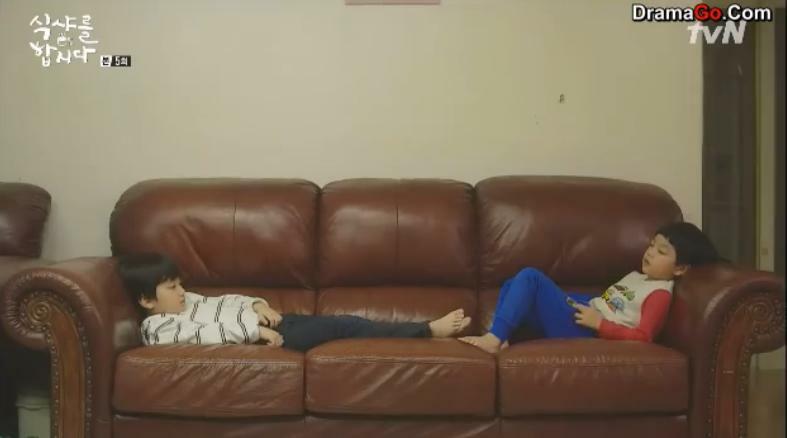 While Kyung Mi drags Kyu-sik into the bedroom to beat him up, their two sons complain about how they’re always hungry and puts the blame on their father. Lol. At Jin Yi’s apartment, all 3 neighbors are hanging out together since Dae Young had to give Jin Yi her parcel. While talking, Soo Kyung and Dae Young happen to agree on a subject which surprises Jin Yi so she assumes that they’re getting along. Soo Kyung and Dae Young just stare awkwardly at each other before Soo Kyung walks out of the apartment, denying it. In her own apartment, Soo Kyung admits to Barassi that Dae Young seems like a better person than she thought. Kekeke. Is this Soo Kyung opening up to her neighbors? Just like how the 3 neighbors agreed to eat together from now on, they also agree to purchase grocery food as a group. That’s when Dae Young recommends that they divide the milk that Jin Yi registered for (in exchange for the free bike which isn’t really free) which Soo Kyung and Jin Yi approves of. Jin Yi also wants to share her bike with her neighbors so Dae Young volunteers to ride it first. 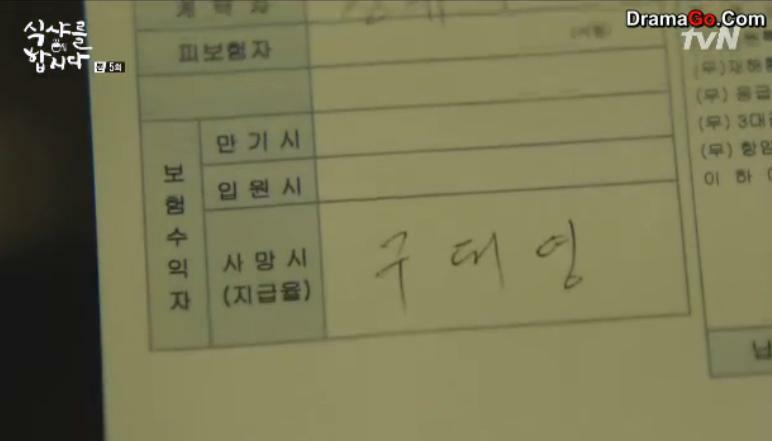 While Soo Kyung and Jin Yi are taking out their trash, Soo Kyung finds a contract for insurance from the previous owner in Jin Yi’s apartment that passed away. It turns out that this woman that had bought insurance from Dae Young had also listed him as the beneficiary. This makes Soo Kyung shocked and taken aback because there are now two ladies that have listed Dae Young as their Beneficiary. But what makes her panic even more is how those two ladies were also living alone but then eventually died, listing Dae Young as their beneficiary for the insurance he was able to sell them. OMO OMO OMO. What is this?! (also, the ending song isn’t an OST song – it’s my baby JunHyung’s ‘Flower’ playing during the preview for the next episode. Kekeke. #proudB2UTY). Although I do think the whole murder mystery plot is interesting, I kind of wished we didn’t have that in this drama and was instead presented with a conflict that was less serious and dark. I feel as if it contrasts too much from the overall vibe and feel that the drama creates. ‘Let’s Eat’ is a warm, light-hearted, and graceful drama that showcases these three strangers who are neighbors bonding and connecting to each other through food and each episode focuses in on how that connection is created…but then you have this whole mystery with the murders along the way and I fell like it’s just so different and out-of-place I don’t like it. I’m glad that Soo Kyung has noticed how awesome and cool Dae Young is. And I’m not saying this just because I’m biased, but I do think Dae Young is a kind man (if we’re just going to look at it on the surface). Even though his whole intent is to sell insurance to everyone he meets, he still helps them out. And I’m glad that we got to know him a little bit better in this episode because I felt like for the past five episodes, all we ever knew about him was how he was the King of Insurance.